ESPN NFL Insider Adam Schefter reports via twitter that the Titans are scheduled to interview offensive line coach Mike Munchak Monday for their head coaching job. Schefter writes that linebacker coach Dave McGinnis and offensive coordinator Mike Heimerdinger are also scheduled to interview for the job. 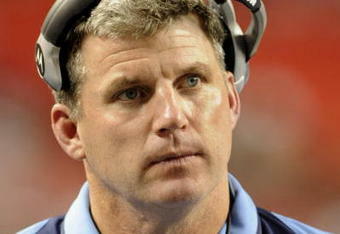 Munchak is considered the frontrunner to be named the team’s new head coach. Owner Bud Adams reportedly views him as a “link to the glory days of the Houston Oilers.” A first-round pick (8th overall) out of Penn State by the Houston Oilers in 1982, Munchak played 159 games for the Oilers, earning nine trips to the Pro Bowl in a career that resulted in his induction to the Pro Football Hall of Fame in 2001.